The screen saver is supplied as a self-extracting file for running under Microsoft Windows and includes the licence agreement shown on this page. By right clicking over the acceptance note below you can download the EXE file to your own computer. Choose a suitable location from which you can run the file and setup will then lead you through the installation instructions. This document is a legal Agreement between you, the licensee, and Barry Hunter. Please read this Agreement carefully before installing the program. By installing the program, you accept the terms of this Agreement. If you do not agree to the terms of this Agreement, quit this installation procedure and promptly delete the files. 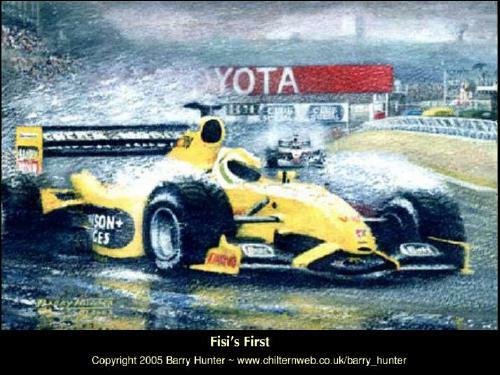 The "F1 Screens" Screen Saver (the "Software") is owned by Barry Hunter and is protected by international copyright laws. Barry Hunter grants you rights to use the Software on a single user computer, or on a single terminal or workstation of a multi-user computer or local area network, or on multiple computers. A. This Software is copyrighted and is proprietary product of Barry Hunter. You may make one copy of the Software for backup or archival purposes. All other copying of the Software is expressly forbidden. B. You may not decompile, reverse engineer, copy, transfer, or other-wise use the Software except as expressly stated in this Agreement. This license is effective until terminated. You may terminate this license at any time by destroying all copies of the Software. This license will terminate automatically, without notice from Barry Hunter, if you fail to comply with this Agreement. Upon such termination, you shall destroy all copies of the Software. The Software is supplied "AS IS". Barry Hunter disclaims all warranties, expressed or implied, including, without limitation, the warranties of merchantability and of fitness for any purpose. The user must assume the entire risk of using the Software. Barry Hunter assumes no liability for damages, direct or consequential, which may result from the use of the Software, even if Barry Hunter has been advised of the possibility of such damages.